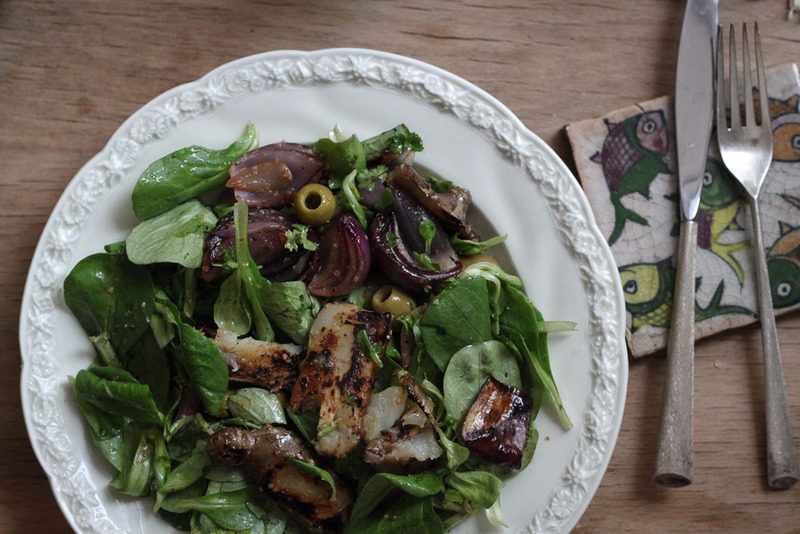 A Premonition of Winter: Grilled Jerusalem Artichoke Salad with Red Onion and Olives – Eat Me. Drink Me. I don’t go to the market often, but when I do, I’m reassured to find my favorites in the same place, with the same good wares to sell. I always start my market tour with a raclette. I like to watch the big rinds of pungent alpine cheese bubble and brown under the hot metal grill, and the aproned woman working the contraption as she swipes the oozy top layer with a big wooden paddle and spreads it on a piece of crusty white bread, sprinkles it with paprika and parsley. After I’ve finished wiping my greasy fingers on a napkin, I sidle over to the front of the truck and buy myself some cheeses to eat for breakfast – a cave-ripened gruyere or a lemon-and-pepper-crusted alpine cheese. I like to let the market spark my imagination. 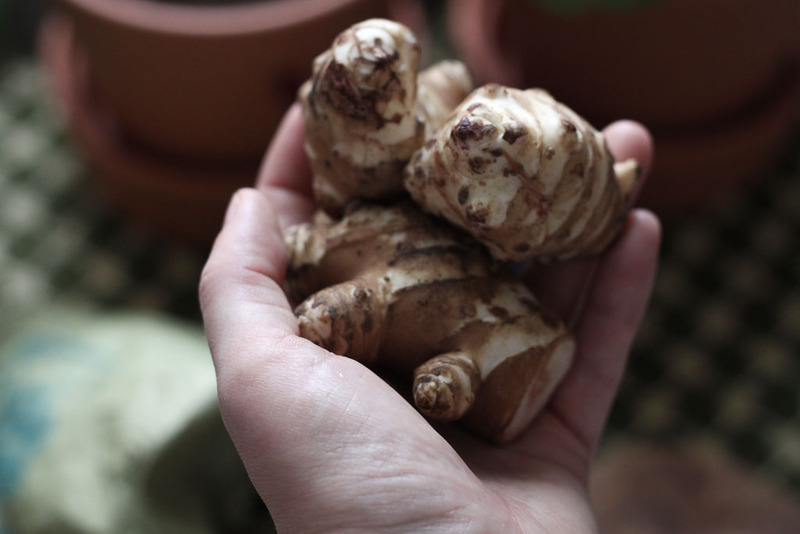 On Saturday, I picked up chanterelles and some knobby bulbs of Jerusalem artichoke. There was a beautiful head of garden lettuce I had to have, plus some tart green olives and an arugula-lime goat cheese spread. The homemade walnut and beet gnocchi were stunning, so I bought up all the rest, and the vendor threw in a handful of pumpkin gnocchi just to try – might as well, she said. And then there was the fish: a glistening, coral-colored slab of smoked salmon wrapped up just right in a piece of smoke-colored wax paper. At home, I leisurely browsed through my cookbooks for inspiration. The chanterelles I decided to sauté with butter, cream, garlic, sage, and a splash of Marsala wine to make a sauce for the gnocchi. 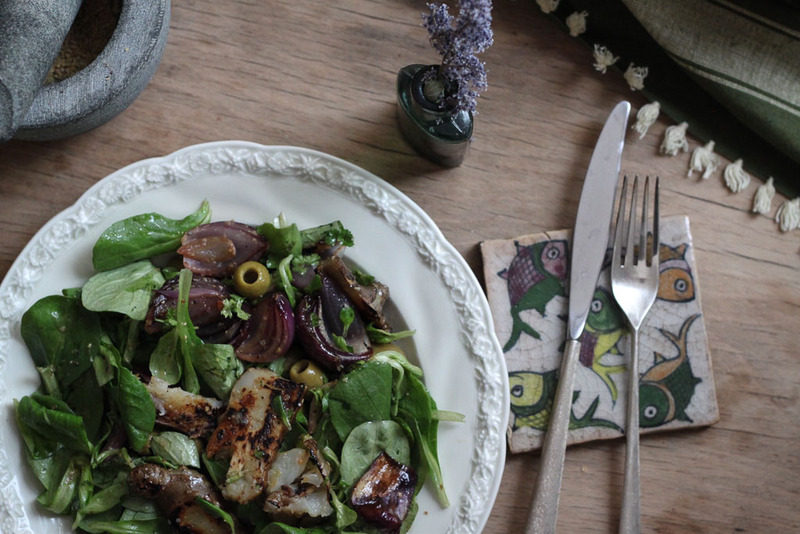 And the Jerusalem artichokes would be the basis for an autumnal salad. Right now, as I sit here writing this, I’m looking out my window at the chestnut tree in the courtyard, at the yellow mottling on its leaves, the thick black branches starting to menace, and realize I desperately, viscerally, violently do not want the coming winter and the cold. Already, inside myself I feel the tug of hermitude. It’s a feeling that makes me want to curl up on the couch under a blanket to watch Netflix all day with a mug of hot tea beside me and a doubled-up pair of socks on my feet. And not in a cozy, weekend treat sort of way, but rather in a last, ineffective act of desperation against the eternal gray of Berlin, the barren trees and icy floorboards. I’ve been kept on my toes this year with so many new and exciting projects to explore that I’ve hardly had time for anything sedentary. Anna and I officially launched The Wolf & Peter, and we’ve been busy catering events and planning our next supper club, which we’ll hopefully be putting on this fall. My old friend and blog co-founder Josh, who is busy these days running Counter Service, is coming to Berlin for a few weeks in October for a series of collaborations and events, maybe even one in London if we play our cards right. I’ve been branching out into new kinds of translation work, started reading again for fun, pursuing new connections, and making new friends. But all that energy feels precarious in the face of what is very nearly here. Because in Berlin, there is no romantic, red-hued fall. It’s all House Stark and winter is coming, and even though it’s not even yet October, I feel the only way I’m going to make it through this winter without climbing into bed and hibernating until spring is to keep moving. Even when I don’t want to. That means going to the Winterfeldt Market and cooking elaborate meals, it means pressing on with projects and social engagements and going to museums and lunchtime concerts and being absolutely relentless about it all. It means anticipation and excitement and looking ahead and ahead and ahead until I come out on the other side. I’ve spent much of this year trying to slow down the passage of time by living more in the moment, and I realize I’m now advocating for the exact opposite of that. If there’s a way to do both, I haven’t quiet yet put my finger on it. Maybe the secret is in the thrill of a grease-stained piece of wax paper, in noticing both the smallest moments and in doing the bigger things that make them possible. Or, the secret is going to spend the winter in Majorca with the rest of Germany. 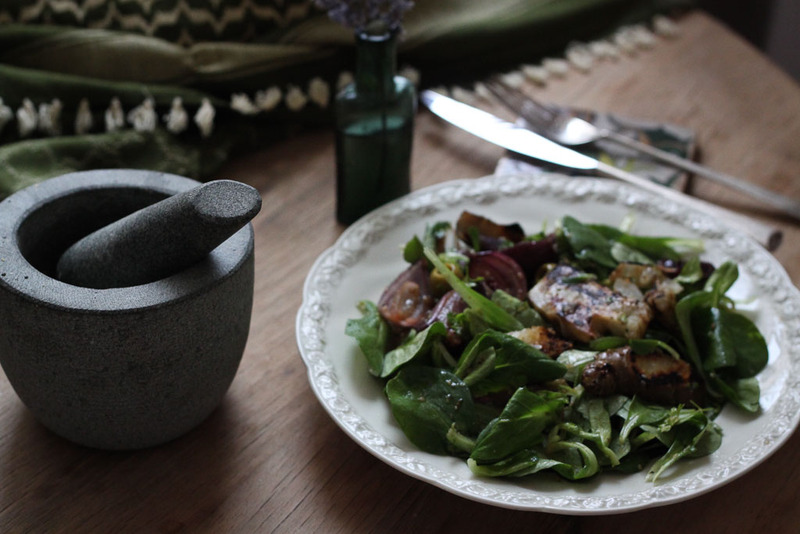 On the gray and drizzly Sunday after market day, I set about making my salad. 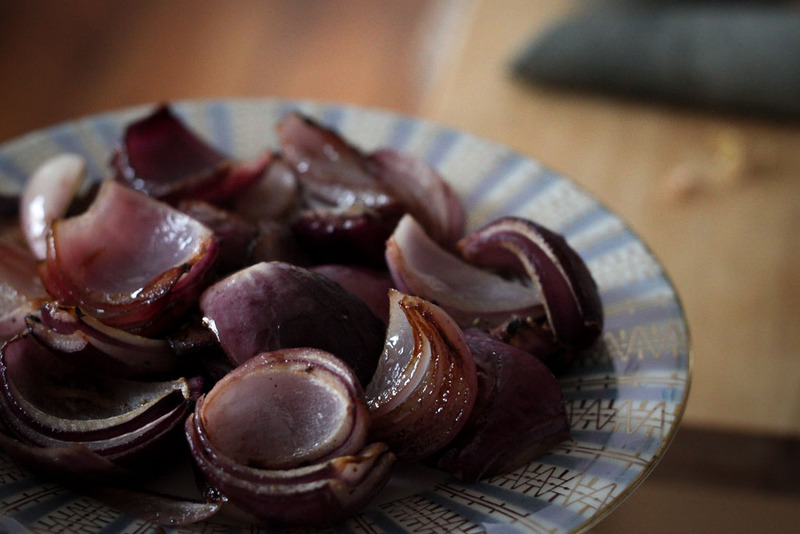 I boiled the Jerusalem artichokes, tossed the quartered red onions with balsamic and oil and put them in the oven to roast. 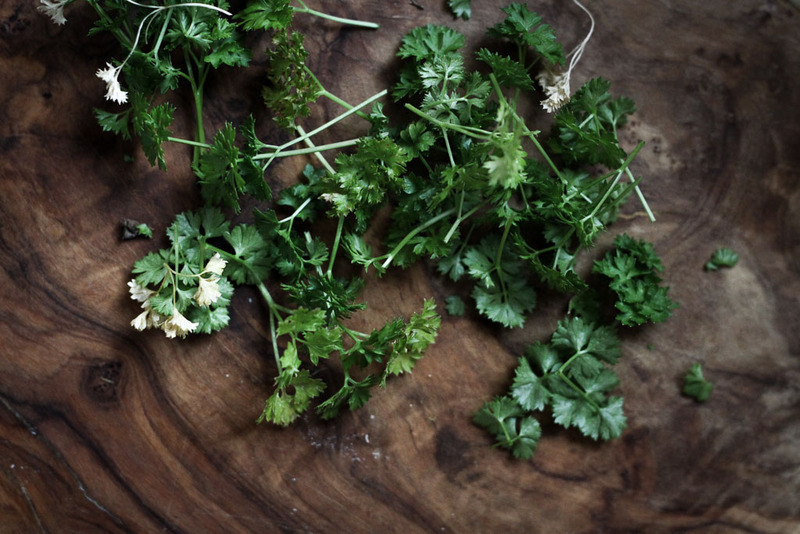 I washed and trimmed mâche and plucked parsley from the pot in the kitchen widow. 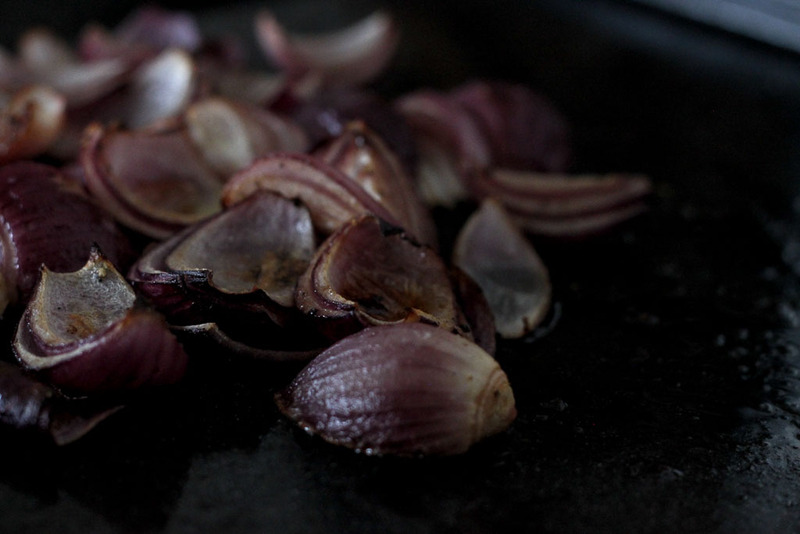 It felt as fleeing as a golden autumn day, the onions still slightly warm and the Jerusalem artichokes seared from the heat of the cast iron pan. But somewhere in that process, I forgot about the chill and damp, my cold-prickled skin wrapped up in wools, and found myself just looking forward to the next thing, and then the next. 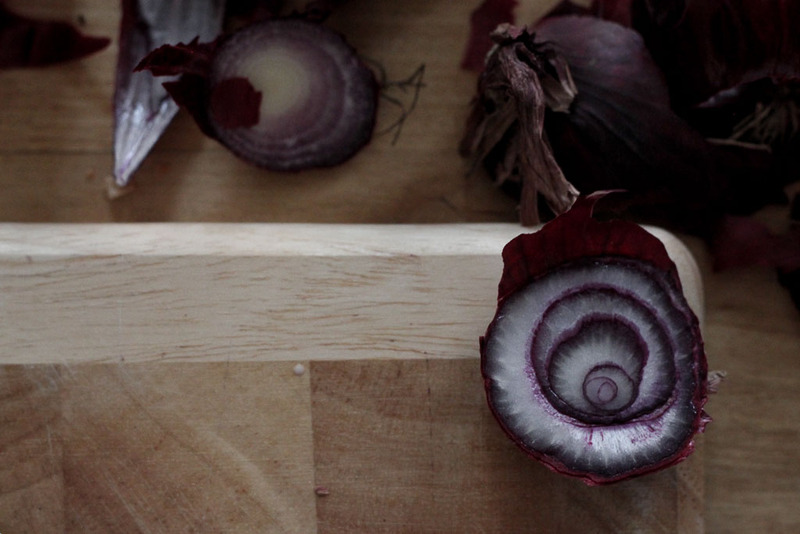 This recipe is adapted from The Whole Beast, by Fergus Henderson. Fergus (Fergus, can I call you that? ), is one of my very favorite writers of recipes and says things like, “parsley acts as a great marrier of disparate parts in a salad, the dating agency of the salad world” and asks you to find olives with “gnya.” If you do not own this cookbook, you must remedy that immediately. 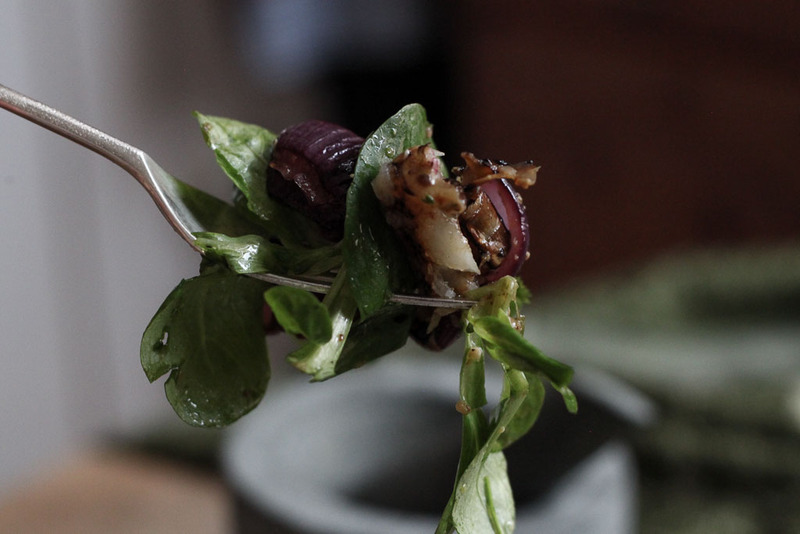 He also calls for watercress in the salad rather than mâche. I have only rarely found watercress in Berlin, hence the substitution. Serves 2. 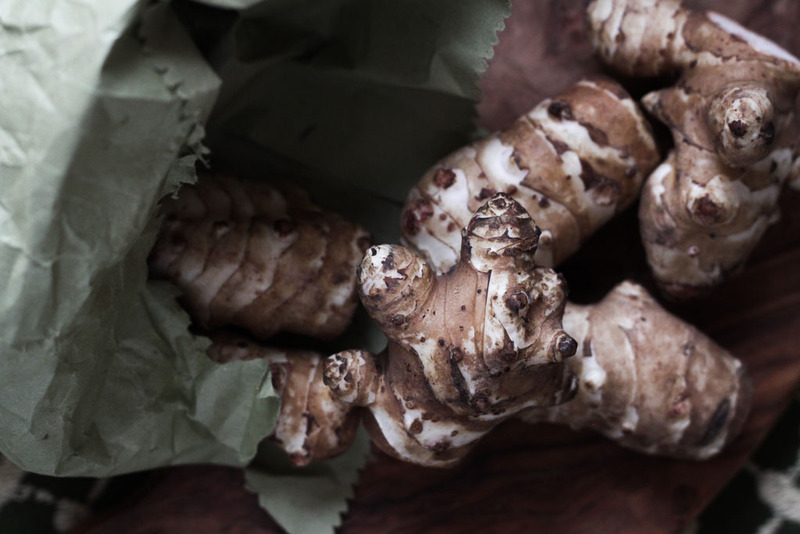 Bring a pot of salted water to boil, and cook the Jerusalem artichokes in it for 15 minutes, until they give, but are not mushy. 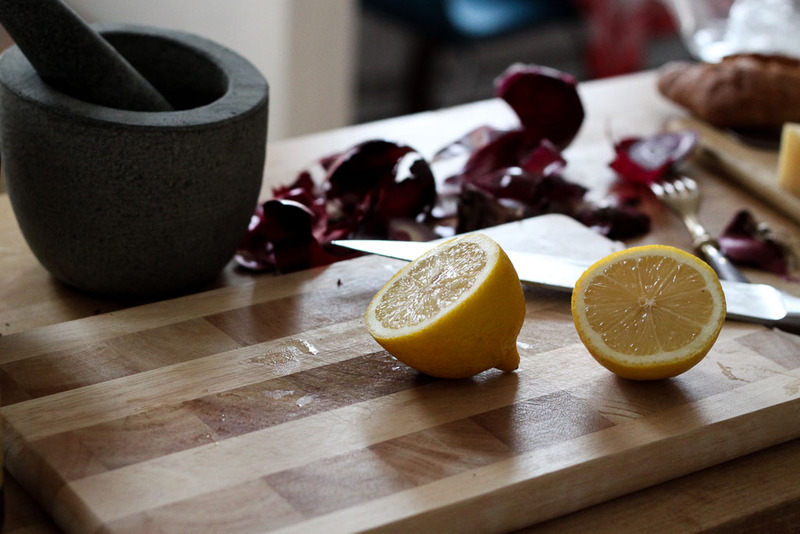 Allow to cool, and once cool, slice into about ½-inch (1½-cm) slivers. 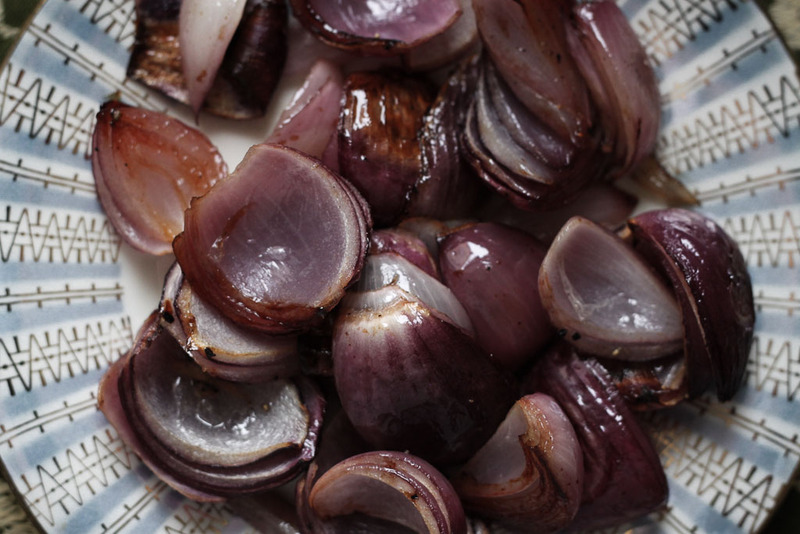 In the meantime, toss the onions with olive oil, balsamic vinegar, salt, and pepper, then arrange on a baking sheet and roast in a 375 ºF (190 ºC) oven for about half an hour, until soft and slightly charred. Remove from the oven and set aside. 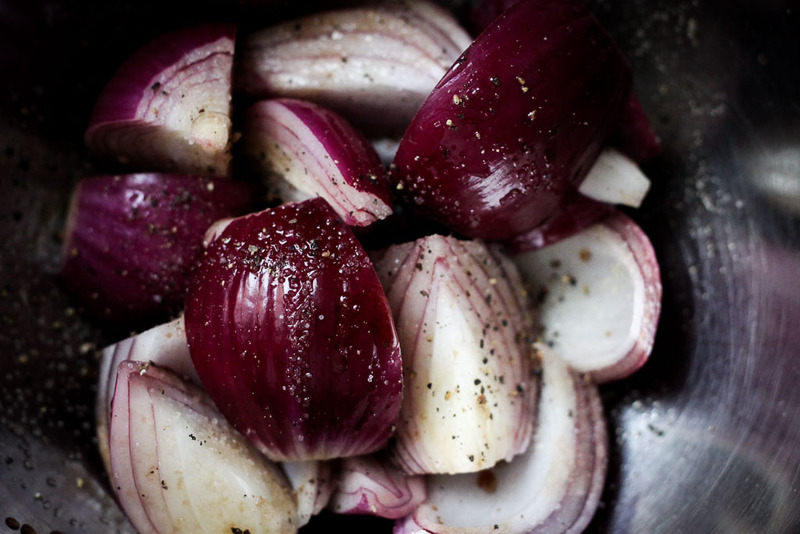 Whisk together the vinaigrette: olive oil, lemon juice, Dijon, white wine vinegar, garlic, salt, and pepper. 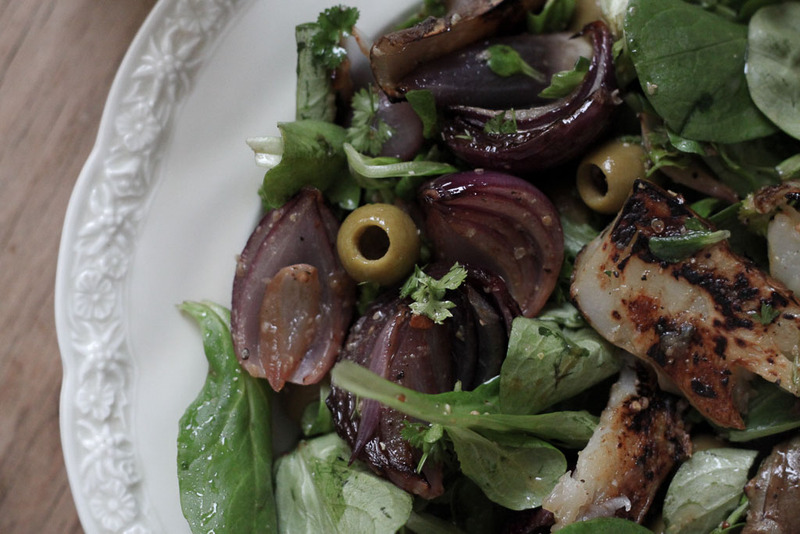 In a large bowl, toss mâche with olives and parsley. 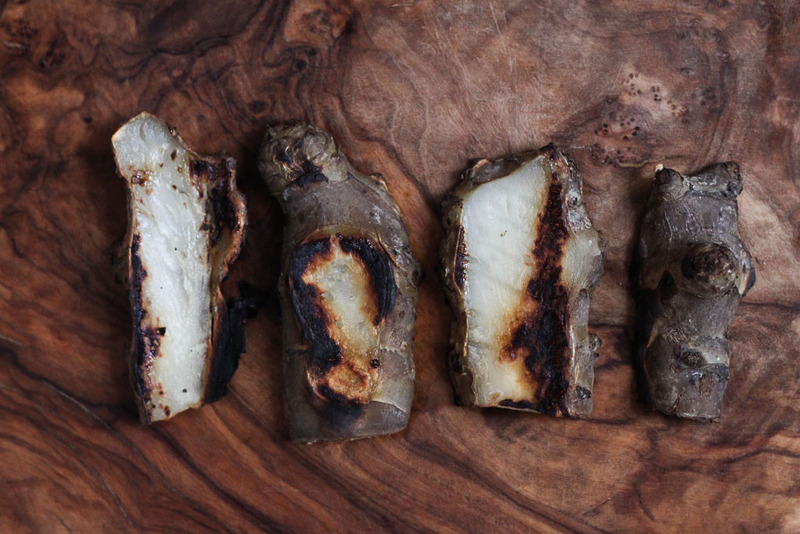 Using a dry cast iron grill pan (in a pinch, any pan that gives a nice sear will do), grill the slices of Jerusalem artichoke until they are nicely charred, about 3 minutes per side. Make sure your grill pan is hot. 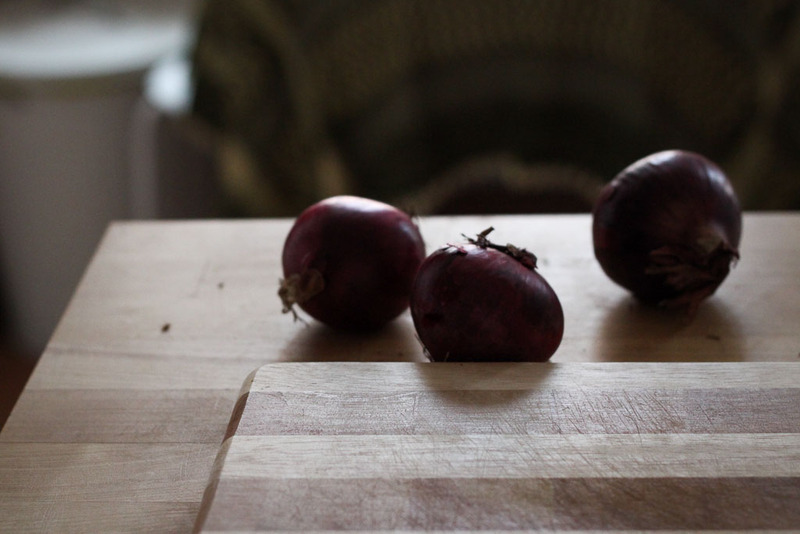 Add onions and still-warm Jerusalem artichokes to the large salad bowl and toss with vinaigrette. So delighted that Josh will be there soon to interrupt your hermitude, Lyz! Most golden autumn greetings to you both. We’re so looking forward to being reunited in a joint project once more!